Sunderland’s summer transfer business is set to ramp up this week – with improved due diligence on potential signings absolutely key. New boss Jack Ross is due to return from his summer holiday in Greece in the coming days and will get straight to work on transfers. 21-10-2017. Picture Michael Gillen. Picture Michael Gillen. FALKIRK. Falkirk Stadium. Falkirk FC v St Mirren FC. SPFL Ladbrokes Championship. Jack Ross. Ross will have full control over recruitment and owner Stewart Donald has made it clear the club’s due diligence when it comes to doing homework on players has to improve. 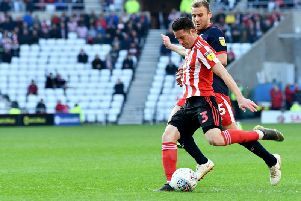 Sunderland have suffered back-to-back relegations to leave the Black Cats in League One and the squad facing a major summer overhaul. Ross will have no time to waste when he gets to work at the Academy of Light. His predecessor Chris Coleman had spoken openly before his departure about the days of spending large amounts of money on individuals and throwing together a team had gone at Sunderland. The focus had to be very much on getting to know every detail possible about any new signings; personality, character, their history both mentally and physically. And new owner Donald – who spent the weekend in Monaco meeting with potential investor Uruguayan businessman Juan Sartori – has spoken of his desire to get the right characters in to the club. Donald said: “We’ve got to get the right players to fit the culture and then ensure that we don’t lose that through the journey. “The higher up you go the harder that becomes, but it isn’t impossible. “If the academy can play its part by bringing through youngsters with the right core values then we’ll have a chance. Sunderland have already been credited with interest in £3million-rated Hibernian midfielder John McGinn, 23, though there is significant interest in him from clubs higher up the league pyramid both north and south of the border. The 19-year-old midfielder has caught the eye at St Mirren and could follow manager Ross to the Stadium of Light. He is valued around the £1million mark. Ross built a vibrant, exciting squad at St Mirren and put his confidence in youth.